Season series: This is the first of three meetings between the Boston Bruins and New York Rangers. They will meet again on Nov. 29 at TD Garden. Big story: The Rangers will get forward Rick Nash back for this "Original Six" matchup that will be televised nationally in the United States and Canada. Nash last played Oct. 8 against the San Jose Sharks, suffering a concussion on a hit by Brad Stuart. "I'm excited. Kind of a controlled emotion. It's been a long six weeks, so I'm excited to get in there," said Nash, who was on a line with Brian Boyle and Carl Hagelin at the morning skate. "I think the first everything is going to take a while, whether it's a hit, a shot, a pass, making different plays. It was a long time off, so it's going to take some time." After Tuesday night, the Rangers, who have three goals in their past three games, won't play at Madison Square Garden again until Nov. 30. Boston is wrapping up a three-game road trip and will play its second game in as many nights after earning a 4-1 victory against the Carolina Hurricanes on Monday. Bruins: After opening up their road trip with a 4-2 loss to the Ottawa Senators on Friday, the Bruins responded nicely at Carolina. Reilly Smith and Carl Soderberg each had a goal and an assist and Tuukka Rask made 23 saves to help Boston pull within a point of the Tampa Bay Lightning for the Atlantic Division lead. The win also ended the Bruins' three-game road skid. Boston's penalty kill streak was put to the test Monday, when it was forced to kill a 5-on-3 for 1:03. The Bruins survived and have now killed off 32 straight power plays. "We won faceoffs and we were in the right place to ice the puck," coach Claude Julien said. "We iced it three times. With 1:03, they could have spent a lot more time in our end, but we didn't give them that opportunity. Our guys were in the right position, so we got what we wanted out of it." Rangers: Nash is expected to play regular shifts at even strength as well as on the power play, which is good because offense continues to be a problem for New York. The Rangers have played back-to-back 1-0 games, winning Saturday night against the Montreal Canadiens at Bell Centre before being blanked at home by Ben Scrivens and the Los Angeles Kings on Sunday. New York had more than five minutes of consecutive power-play time in the second period, but couldn't convert. Twenty games into the season, the Rangers have scored 42 goals. "You have to find a way to score on your 5-on-3s," center Derek Stepan told the New York Post. "I thought we had some looks and had some plays there, but we weren't as sharp as we need to be. Who's hot: Bruins forward Loui Eriksson had an assist Monday, extending his point streak to six games (two goals, five assists). Milan Lucic has two goals in the past three games. … Rangers center Brad Richards has six points in as many games (one goal, five assists). Injury report: Bruins defenseman Adam McQuaid (lower body) has missed four straight games and is questionable. 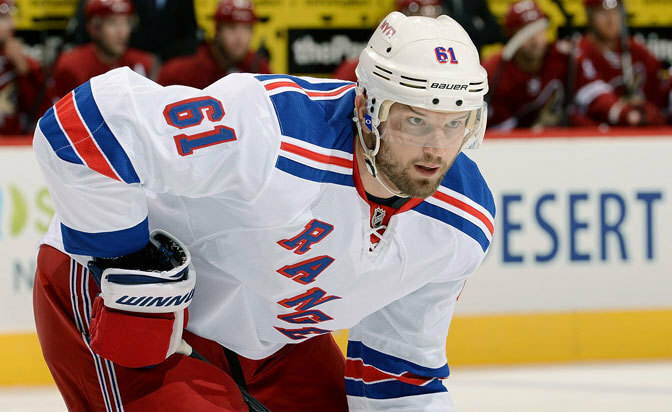 … Rangers forward Taylor Pyatt (concussion) is out.